"They fought back to back... No quarter given... No quarter asked... No way in... No way out... of Rio Bravo!" John Wayne, Dean Martin, and Ricky Nelson star in this 1959 Western directed by the legendary Howard Hawks. Wayne plays John T. Chance, the sheriff of a Western town. When he arrests the brother of powerful land baron Nathan Burdette (John Russell) he has to deal with the consequences in the form of a band of hired guns bent on releasing the prisoner before he is brought to justice. Chance enlists his old friend Dude (Dean Martin), who is now the a hopeless drunk, and young hotshot Colorado Ryan (Ricky Nelson) in the hopes of holding out for the six days it will take for the US Marshall to arrive for their prisoner. Considered one of Wayne's finest performances, Rio Bravo was written by screenwriters Jules Furthman and Leigh Brackett, and was based on a short story by B.H. McCampbell. It also features a musical duet by Dean Martin, then at the height of his fame as a crooner, and teen idol Ricky Nelson. Also appearing in the film are Angie Dickinson in one of her first movie roles, and character actor Walter Brennan. 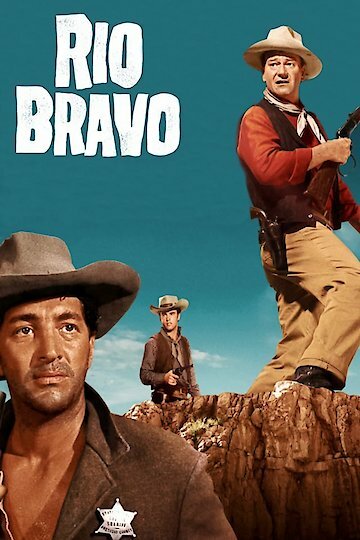 Rio Bravo is currently available to watch and stream, buy on demand at Amazon, Vudu, FandangoNow, iTunes online.